Before Chinese New Year, we sat down with Mr K Baskaran to have a chat about his living room home theatre setup in his charming HDB flat decorated with unique Indian musical instruments and artwork. For his front left and right speakers, Mr. Baskaran opted for a pair of white Focal Aria 936 floor-standing speakers. He told us that he had originally decided on the Aria 936’s smaller sibling the Aria 926 but found the larger 936’s had an improved mid-range while still managing to fit his living room. Paired with a white Aria CC900 center channel, a white Focal Sub-Air Subwoofer, flax-driven Focal 300ICW4 in-ceiling speakers and the Denon AVR-X6400H receiver, Mr. Baskaran soon found himself to be the proud owner of an "All Flax" setup with even the in-ceiling speakers having flax-drivers. The Flax Sandwich Cones found in the Aria series are the result of five years of research and development. Due to their unique qualities of rigidity, lightness and internal damping, the cones have a certain neutrality and openness to their sound which combined with their attractive price (keep in mind they’re Made in France), making them a very accessible series packed with some of the best technologies Focal has to offer. When we asked him about what challenges he encountered when choosing his system, Mr.Baskaran told us about how he wanted to integrate in-ceiling speakers into his setup but encountered some resistance from his contractors. The issue he mentioned, was that his contractors, possibly due to being ill-equipped with the skills, were insisting on using a Soundbar with 5.1 virtual surround features. 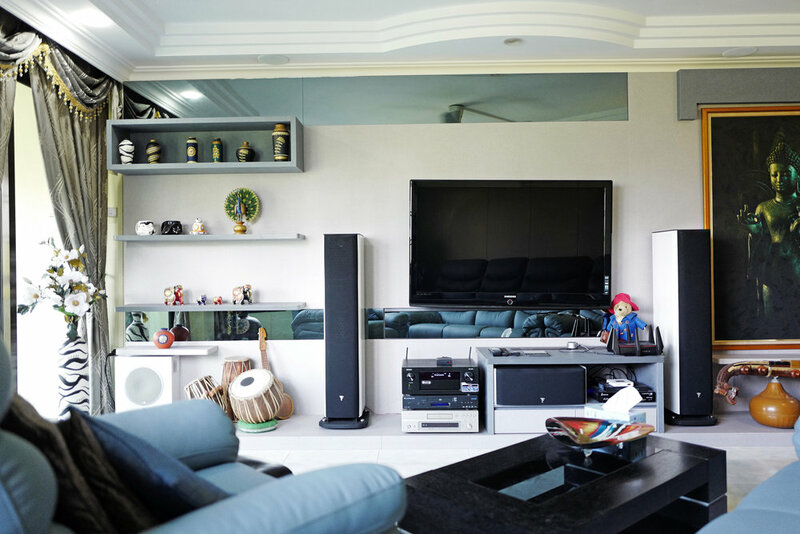 Having experience in audio and a discerning ear, Mr.Baskaran knew that a Soundbar while convenient, just could not compare to a full-fledged home theatre system so he opted to visit us for a second opinion. After Mr.Baskaran approached us with this dilemma, our home theatre specialist dropped by for a site visit and found the solution would be to convert some of the pre-existing lighting wiring tracks and box lighting into audio wiring tracks and in-ceiling speakers for the additional layer of immersiveness. When asked about how he liked to use his system, Mr.Baskaran told us that he primarily enjoyed watching a lot of local Tamil TV shows in addition to a movie every now and then. He added that after Singapore made its move from analog TV to the digital domain, the majority of local TV channels available today are all mostly mixed in multi-channel audio. He explained that this was the reason why he wanted an entire home theatre system in the first place and that opting for a Soundbar wouldn’t do it justice since with a full home theatre system, even regular TV shows turned into a different experience entirely and upon completion of the project, Mr.Baskaran was very happy with the outcome.